I'm Trinidadian. 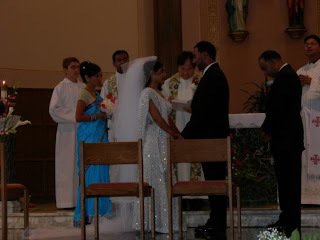 Ten years ago, I married into a boisterous (and sometimes meddlesome) Bengali-Catholic family. While we've certainly had our share of cultural clashes, I have always been amazed at how successful they are at preserving their traditions and beliefs—particularly in an environment that encourages assimilation, and sees successive generations accepting and injecting more and more mainstream American ideas into the cultural foundation. This weekend I had the immense pleasure of welcoming a long-time friend as an official member of our growing family. 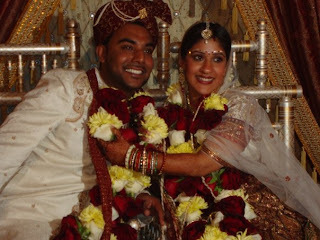 As is customary with the South Asian community, the wedding festivities took place over a few days. What made this event particularly unique, however, is that the bride is Gujarati and so the ceremonies also included Hindu elements. Spanning five days, the celebrations were a well-orchestrated melding of different cultural backgrounds, and revealed insights as to how cultures can be preserved in the face of immigration and interfaith marriages. The following night, the bride then hosted a Mendhi Night, where beloved female relatives decorate themselves with henna in honor of her wedding. Henna, or mendhi, is a reddish brown dye that is used to create intricate patterns on the womens' hands and feet. The bride's henna went up to her elbows in a beautiful, detailed pattern. Her feet well up to her calves were also covered with intricate patterns. Historically, certain patterns are said to have particular meanings. Unfortunately, it seems that some of this knowledge has been lost. While there were many women able to produce the henna patterns during Mendhi Night, when pressed for an explanation on the meaning of the designs, the overall response was that the patterns were decorative. An older aunt did go so far as to say that henna was done for joyful celebrations—Diwali, weddings, births, etc. Bengali's, being of East Asian descent, don't have a formal Mendhi Night, but they do practice the art of henna. Only the groom's immediate family was invited on this night, which is mainly for the bride. On the day of the wedding, the bride walked down the aisle in a white and silver lengha. A lengha is skirt and blouse combination. They can range from simple to very elaborate designs, with intricate embroidery and beading. The bridesmaids wore different colored saris linked together by gold blouses. The groom positively glowed in his tuxedo, and his groomsmen tied the entire bridal party together with muted gold vests. After the rings had been exchanged, and the bride and groom were married again--in a Hindu ceremony. As is tradition, they took seven steps together signifying seven vows to each other as they begin their life together. They also walked around a small fire. Fire is particularly important in the ceremony as it is representative of the god, Agni, who serves as witness to the ceremony. Agni is an important Vedic deity. A messenger to the other gods, he's reputed to carry sacrifices and offerings to the other world via fire. (Cultural note: Does Agni remind you of any other deities? I wonder if we could trace their roots to Agni.) For this portion of the ceremony, the groom wore formal Indian-wear and the bride wore a traditional, beautiful wedding sari. Despite the religious differences, families from both sides first packed the church and then the hall where the Hindu ceremony was held. It was a beautiful and moving series of events marked by both joy and sorrow. I was extremely grateful that my relationship with the bride allowed me an additional perspective on the process. It is precisely because I was able to participate on both sides that I truly understand how important a role food played in tying both sides together. Anthropologists have long known that food brings people together—breaking bread with someone is the ultimate act of acceptance, forgiveness, and love. If you don't believe me, check out Anthony Bourdain's No Reservations, or any other of the food anthropology shows popping up on cable. (Of course, you could always go watch Indiana Jones and the Temple of Doom—after all, Indy has long been accepted as the epitome of an anthropologist, right? In the scene where he and his blond companion crash land in a very poor Indian village devastated by the loss of their lingas, they are offered some very unusual fare which Indy orders his companion to accept. He explains that it is all these poor people have to offer, and it would be extremely offensive to refuse their hospitality.) In any event, this couple's union provided the opportunity for both sides to experience each other through food even though they may not have completely understood the significance of ceremonies for each group. Cultures define themselves through food, and food remains a portable means of transporting culture when groups immigrate. It allows people to connect to their roots, their history, their traditions—all in a single bite. So it is fitting that a wedding that merged two different religious groups saw ties forged and cemented with food from both cultural backgrounds. Food broke the ice between groups as more the more adventurous of the Bengalis freely asked questions about what was being served and sampled accordingly. Interestingly, these were the folks who seemed more at ease mingling with the bride's family, although custom dictates that all present must socialize (part of the reason for these events is to help family members get to know each other before the big day and help ease the transition for the bride and groom). So, let's talk about it: How is food used in your cultural background? Are there special meals for special occasions? And congrats to the happy couple! Wishing you many happy years together!